Samsung Flat-panel TVs with 30 channels of HD programming. Easy-access Plug-and-Play feature makes it simple to connect electronics. The La Quinta Inn & Suites Orlando South features pillow-top mattresses, oversized work desks, free high-speed Internet access, and more! When coming to the Orlando area, the La Quinta Inn & Suites Orlando South is convenient to such area attractions as Walt Disney World, Universal Studios, and SeaWorld Orlando. We are surrounded by a variety of great restaurants with one next door, and only a mile from the Florida Mall. The entertainment venues of the Orlando/Orange County Convention Center are just four miles. In about an hour you can reach Lego Land and the Kennedy Space Center. 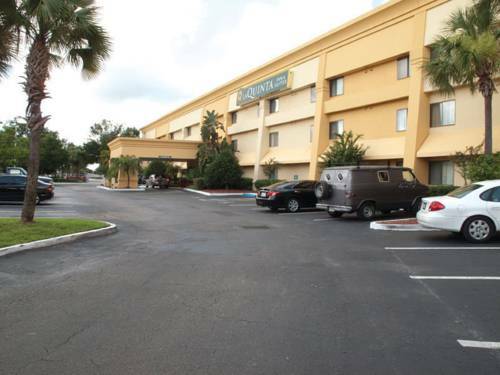 Excellent amenities at an outstanding value are what you get at the La Quinta Inn & Suites Orlando South. All spacious rooms in a modern decor come with 32" flat-screen televisions with plug & play capabilities, free high-speed Internet access, an ergonomic desk chair and work desk, an iron/board, coffee maker, hairdryer, and lots more, plus comforts like pillow-top mattresses and a popular television channel package. There's a sparkling outdoor swimming pool for your enjoyment. Wake up each morning to our delightful Free Bright Side BreakfastTM. We are just off I-4, twelve miles from downtown. We also have laundry facilities for our guests. 1 mile south of the Florida Mall on the corner of Orange Blossom Trail and Consulate Drive. Two blocks from the Metra Train Station.